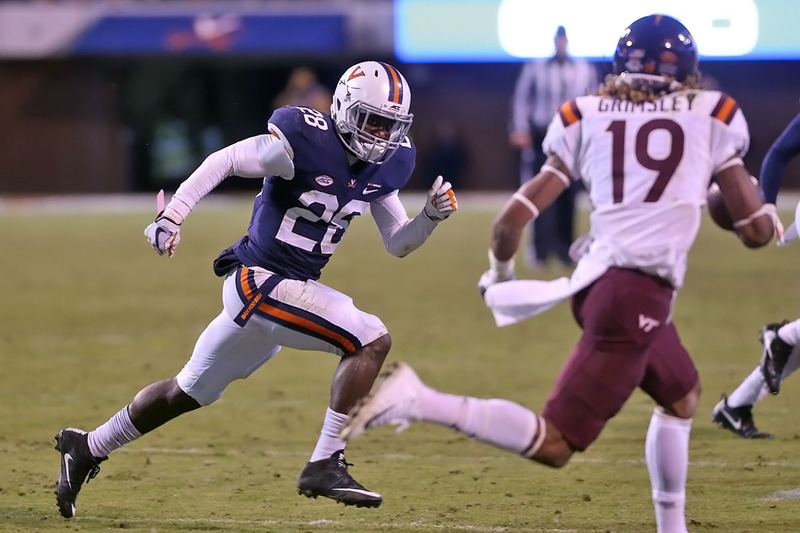 When last season’s preseason practices began in August and outside observers started to preview the Virginia football team, the name Brenton Nelson slowly gained steam. By the end of the season, Nelson had climbed all the way to ACC Defensive Rookie of the Year. As the 2018 season approaches, Nelson is again expected to be a key starter on the defense. What does his encore sophomore season look like? The “99 Virginia Football Thoughts Before Kickoff” series continues. Brenton Nelson arrived at Virginia as a lightly recruited walk-on with as much perceived potential in track and field as football. While he had earned all-conference recognition in football at two high schools, first at Winter Springs in Florida and then at DeMatha in Maryland, he owned school records in the long jump and triple jump at both too. Still, he wanted to play football and decided to take a chance as a walk-on at UVA. After a redshirt freshman season where he caught some of the coaches’ attention on the scout team, Nelson emerged in the spring of 2017 as a potential candidate for playing time. By the time August practices warmed up, he had earned a scholarship and a prominent role in a sub defense package. That’s an impressive surge, but just the start of the tale. When the 2017 season kicked off, Nelson was in the starting lineup for Virginia’s nickel package (a 2-4-5) in place of a defensive end. Early in that game against William & Mary, cornerback Tim Harris got hit with a season-ending injury and that set the stage for Nelson’s role to increase. The Cavaliers opted to move Juan Thornhill from safety back to corner and then shifted Nelson into the starting Sabre safety role. He ended up starting the last 12 games of the season in that spot. Nelson made the most of the opportunity. He recorded 64 tackles (35 solo) along with four interceptions. That was enough to carry him from an unknown walk-on to a Power 5 Rookie of the Year. That rise played a huge role in Virginia’s return to a bowl game last season after a six-year absence. In fact, one could argue that Nelson’s emergence proved to be a key piece in the defense’s development. It was similar to London Perrantes’ role as a freshman for Tony Bennett’s basketball team. Perrantes fit in around a lot of more prominent players on that team and became the straw that stirred the drink in a way. Nelson plugged in around players like the program’s all-time leading tackler Quin Blanding and three-time ACC leading tackler Micah Kiser to allow the defense to function as a whole. Think about it. If the coaches didn’t have confidence in Nelson’s ability to start at safety, perhaps the choice is to leave Thornhill there instead of moving him back to corner where he earned third-team All-ACC honors in 2017. Maybe that thrusts a freshman like Germane Crowell, Nick Grant, Darrius Bratton, or Joey Blount into too big of a role too quickly. Instead, UVA ended up with two strong corners and a tackling machine safety on the field together. Beyond that, though, Nelson also added a ball-hawking element to the secondary. He defended 10 passes overall and tied for the team lead with four interceptions. That was tied for 29th nationally as well. That helped push the defense to 15 INTs as a group, which tied the 2014 team for the most since at least 2008. Fast forward to this year’s preseason camp and Thornhill thinks Nelson can be even better. Thornhill has as close of a view as anyone to that because he’s slated to start at the other safety spot alongside Nelson. He moved back from corner to take over the free safety role vacated by Blanding. With Harris back and a year’s worth of development in the rearview mirror for the likes of Grant and Bratton, Thornhill thinks he’ll be able to stick there this time around. That creates an intriguing one-two punch at safety for Virginia between Nelson and Thornhill. While it’s hard to imagine the safety spot could be “better” than with Blanding, who finished up with 495 career tackles, it’s easy to see a scenario where at least the pass coverage piece of the job is improved. There are reasons that’s possible. First and foremost, both Nelson and Thornhill enter the season having played two full seasons in Mendenhall’s schemes whereas Blanding played two years with a different coordinator first. That’s a big advantage for the personnel around the safety as much as anything so while Blanding often tried to (and arguably had to) cover up for some miscues around him and got out of position in pass coverage, these two safeties won’t have to worry about the parts surrounding them. Second, both have speed and thus a lot of range in the centerfielder mold. They will be an upgrade from Blanding in the speed department, though he made up a lot of it with his acumen. That could lead to a more disruptive style of play at safety. Blanding finished with 10 interceptions and 27 defended passes in his career, which included a career-high four INTs last season and a career-high nine passes defended back in 2014. Nelson matched or surpassed both of those categories last season with the four picks and 10 PDs. Thornhill also grabbed four picks last season with 16 passes defended. What kind of chances will this duo have to break things up as a safety pair? Of course, the biggest key for Nelson’s encore overall may be staying healthy. When he redshirted in the fall of 2016, he was slowed in part by a hamstring injury. Late last season, he spent many of the final games at less than 100% with an apparent ankle sprain that led to noticeable limping in games. He sat the 2018 spring practices at Virginia injured too. There are options with Blount showing well at safety this offseason too. It will be interesting to watch Nelson’s encore storyline play out in 2018. The “99 Virginia Football Thoughts Before Kickoff” series has discussed much more. The previous articles are below. Click away. No. 85 – The Tight End Swan Song? No. 79 – Which Red Zone Offense Is The Real One? No. 77 – Who’s The Worst? No. 71 – Redshirted … Ready? No. 62 – True Freshmen Will Play, But Who Will Make The Most Impact? No. 56 – Lordy, Lordy, How ‘Bout 40? No. 50 – Beat Tech! No. 47 – Beat Pitt! No. 39 – Please Stay Healthy! No. 30 – Deja Vu With Dubois? Kris- Wow I am really impressed with your football IQ. You and Chris have written just 70 articles since the end of Spring practice and I am unable to describe adequately what a pleasure it has been for me to be entertained or better put, kept on the leading edge of the football program during the darkest months, days and hours of the season. It is almost like when the space shuttles used to orbit the Moon and for a period of time Houston Control lost total contact with the astronauts and I am certain that it was just as anganizing for Houston Control to be without contact asit is for us as fans of Virginia Football to be without contact with the team. As I told you months ago, I usually turn off my monthly subscription to thesabre.com for at least three months between spring and fall practice because nothing is going on, but this year you saved me and probably countless others. Also, as I have told you before, I followed BYU avidly since Bronco arrived as DC in 03 – 04, although I did not move to Utah until the beginning of the 04 season. Then I followed him as the HC from 05-15, communicated with him, met him many times, etc. and when he resigned in December 2015 and accepted the job at Virginia I followed him and the other coaches to Virginia and became a HOOS fan. I attended BYU and four of my children have as well and so I continue to be a BYU in every sport except football and that is because of Bronco. I never played football, so I am in no way an expert. However, I have played and coached other sports at the high school and college level and I can tell you frankly and truthfully that Coach Mendenhall is probably the best coach and man I have ever met. He is truly as honest, rock solid, humble and hardworking man and a man of unequalled integrity. Former BYU player Jamaal Williams who came to BYU as a minority SA and not a member of the LDS faith and is now with the Green Bay Packers did so along with many others like him because his Mother met Bronco and wanted him to play under and be mentored by him. I do not know if Virginia will ever get to the level of Clemson but I do know that he will get them to perform to the best of their ability individually and as a team, hw will do it the right way and his players will reach their potential off the field also.